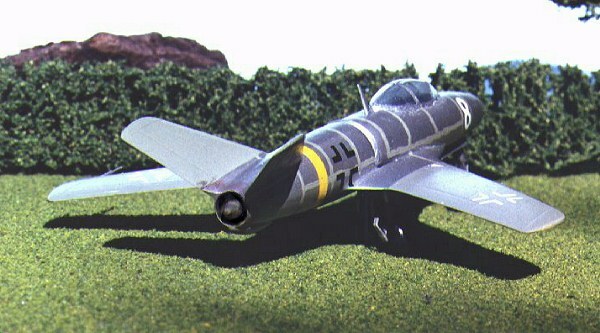 This kit is fairly similar to the one below differing only in the arrangement of the jet intakes being more conventional and hence looking more like a real jet from the '50's. 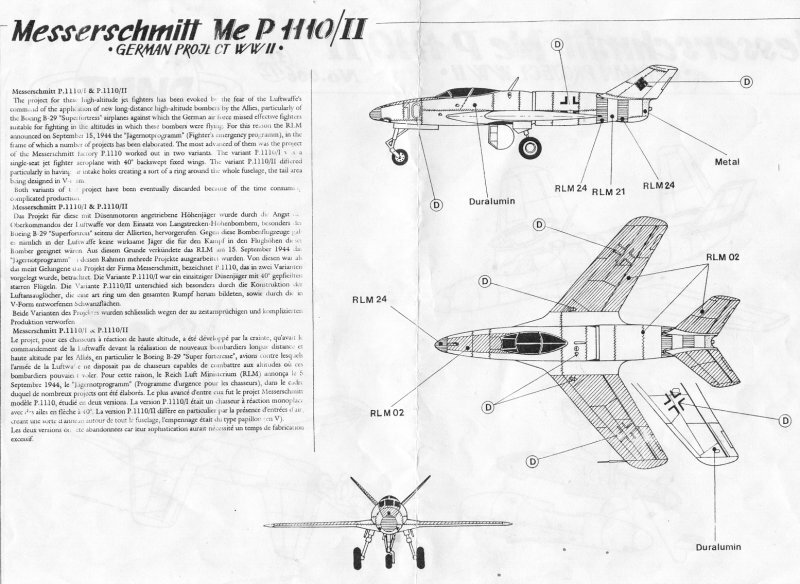 The Me P1110/11 was a low wing fairly narrow fuselaged jet design . It's major distinguishing characteristics were it's V- tail ( butterfly ) and it's most bizarre feature was a jet engine mounted at the tail with an intake above the wing . This is not strange except the intake circled the whole body which was slightly pinched in to increase the area of the intake . This was a contender in the Emergency fighter program but was abandoned as too complicated . 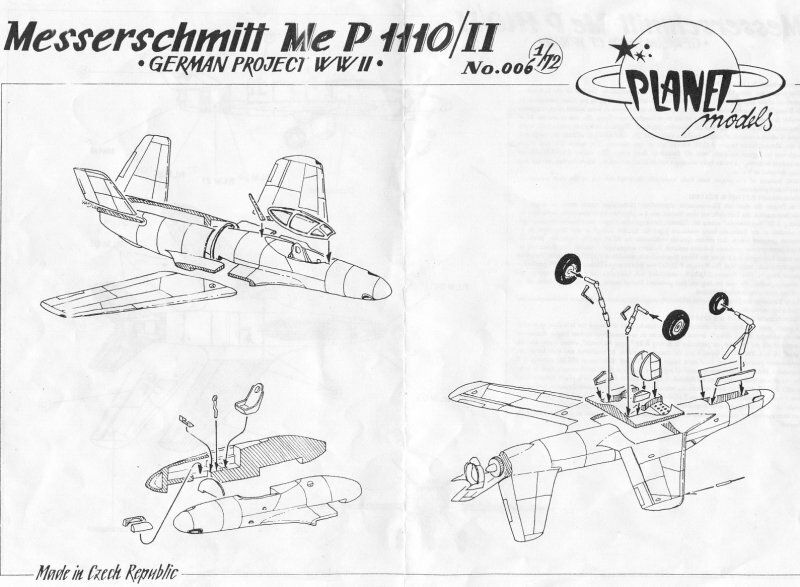 For those 1946 Luftwaffe enthusiasts like myself there is only 1 kit available which is from Planet Models. One note of caution I got my kit for about $26 U.S. here in Australia and I understand a certain large mail order company over there is charging a bit more , I can suggest NKR Models in Australia as a cheaper source ( see the Links page ). This was only my third resin kit but was quite easy , whilst not quite Czechmaster quality it's not difficult taking only three stages . I suggest starting with the front of the body which is two pieces , simple details are provided for the cockpit but more detailing could be done if you're keen . Me , I just slapped the seat , joystick etc. in and threw on some RLM 66 ( Xtracolor ) . Before this drill out the nose gently and put in some lead weight to avoid a tail sitter . When you put in the nose wheel bay you will need to trim these to fit and jiggle these to sit at the right angle to the rest of the bay , do this after assembling the nose as I didn't and had to do a little trimming and filling , my mistake ! Next assemble the rear fuselage and here comes the tricky bit . Paint both the rear and front halves around where they join with black to avoid seeing yellow resin when you look at the engine later . The intake had a splitter plate which must be placed between the front and rear halves when joining these , practice dry fitting this a lot if you have fumble fingers like mine . The diagram for painting clearly shows where it should be but it is a pain to do. I have noticed one review of this where the person has either poked it in too far or thrown it away in disgust , both are easy to do. All that's left now is to add the wings and tailplanes and the undercarriage . Take a little care with the U/c bay as you can place it backwards . At this stage get out your favourite filler for resin ( Milliput for me ) and fill the fuselage joints which inevitably won't be perfect as well as a few air bubbles . Take care around the top MG trough as it tends to fill up when doing this and may need to be deepened . Painting : - Pick a scheme , any scheme . 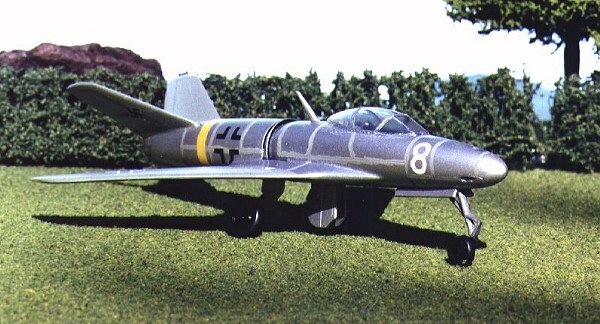 With 1946 Luftwaffe I usually get out a decal sheet for a late war plane of similar type ( 1945 Kommando Nowotny Me 262 ) and follow that scheme and use the decals , as this kit includes decals ( a first in resin kits ) you can simply follow their advice . After painting simply add the U/C making sure to trim the oleo projections for fitting the tyres on as these are far too long and the wheels would fall off if this far out. Rating : - 8/10 Ok there were a few things to fix but nothing beyond the average modeller and the kit really looks the part made up . Buy one , Completed 25/9/96. This is also another early Planet kit now out of production.